A job is a lot like a relationship: it’s fun and exciting at first, but after a while, the butterflies can turn into blahs. Not unlike relationships, an employee’s relationship with work begins with a honeymoon phase, and often has peaks, valleys and plateaus. And much like relationships, inevitably the honeymoon ends, and the employee’s fiery passion can fade to embers that require stoking to reignite. When managers neglect to add extra kindling to the fire, they risk having their employees become overwhelmed, exhausted, bored, and can ultimately invite turnover into their business, and we all know employee churn is expensive. Considering these facts, it is in a manager’s best interest to invest in engaging their employees optimally and keep the fire always alive. Before that happens, keep an eye out for the telltale signs of trouble and take action to address them before they escalate. If your employees are more concerned about the consequences of making a mistake than taking the risk then failing and learning from their failure, you have a problem. What we suggest is turning things around by celebrating employee failures. According to the Bayt.com Learning in the Middle East and North Africa Workplace, March 2015, 73% of professional respondents say their organization encourages people to openly discuss their mistakes and learn from them. An attitude like this gives employees the freedom to take risks, keeps the passion alive, and encourages entrepreneurial and innovative thinking. A clear sign of trouble in the organization emerges when essential information becomes exclusive to a small elite of employees, particularly key information such as company and department objectives, performance and financial results, strategic plans, etc. Privileged insider information should have no value because there really shouldn’t be any in the first place. All information needed to plan, strategize, innovate, measure performance and succeed should be freely shared across the company. The good news is, 72% of respondents say that they have a culture of transparency and honest communication in their workplace, as per the Passion for Work in the Middle East and North Africa poll, February 2016. If you notice that your employees are doing business exclusively via a computer screen, or communicating with each other that way, even when a phone call or face-to-face meeting would be almost as convenient, that’s often a red flag. It may mean that they feel their jobs aren’t worth the extra effort that a face-to-face meeting, or phone call, requires. Face-to-face meetings are always the most powerful approach to building rapport and trust, so set an example yourself by meeting clients and teams in person whenever you can, and encouraging employees to do the same. Over time, your employees will see how much more effective the personal element can be. Look closely at how your employees interact among themselves. Employees who aren’t invested in your organization’s future usually won’t go out of their way to give pointers to the new hire or proofread a colleague’s report, for example. If this is happening in your company, start by matching up new hires with seasoned employees who can mentor and encourage them. The new hire will appreciate the personalized guidance and mentorship. Plus, the more experienced employees will soften when they see how fulfilling it can be to pass on their knowledge and expertise. One-on-one mentoring by a peer/manager was identified as one of the most preferred methods of training by 30% of survey respondents, according to the Career Development in the Middle East and North Africa survey, January 2016. When employees miss deadlines or other important milestones, your first instinct may be to dish out the consequences. By all means, hold people accountable when they don’t meet their obligations. But before you do, begin by examining how your own actions may have contributed to the problem. Do you find it difficult to delegate important projects? Do you insist on running every new idea through you before letting an employee pursue it? If you engage in behaviors like these, you may be making it hard for employees to own their own projects, or finish them on time. If the aforementioned scenarios sound like your company, don’t despair. Deep down, employees are begging to regain a sense of hope and enthusiasm, but they need your help. If you make a genuine effort to follow these tips, taken from our Passion for Work in the Middle East and North Africa poll, February 2016, you will not only notice attitude shifts, but real changes in behavior among your employees. Employees are keen to work harder for a manager who takes a personal interest in them and engages with them on a personal level. 76.8% of respondents in Passion for Work in the Middle East and North Africa poll say their managers provide them with feedback and genuinely care about their professional growth and development. 2. Provide opportunities for innovation and reward participation. The leading barrier to employee engagement is often a lack of strategy and competing priorities. You can circumvent this when you present the challenge with a structure for participation and a system for rewards and recognition. Encourage your employees to learn new skills. Learning a new skill is a great way to feel inspired again and will make them feel valuable. Your employees can read a new book recommended by you, browse industry blogs, take online courses, participate in cross-departmental projects, be assigned a mentor, or simply be encouraged ask more questions on the job. Whether it’s a company lunch or a commitment to celebrating employee birthdays or engagements, these events provide employees with the opportunity to interact on a personal level with each other. They also serve as a great opportunity for boosting engagement levels in your workplace. 87.1% of professional respondents in the same survey mentioned above say that they have a healthy connection with their colleagues at work. Do your employees know how their work contributes to the organization’s goals? Are KPIs understood and celebrated when targets are hit? How will their hard work will be rewarded? Employees want to feel as though their work is meaningful – so let them know. In fact, 91.5% of respondents say that what they do adds purpose to their lives. Asking employees for feedback and implementing their ideas may well be the easiest way to engage your workforce. If your employees feel they contribute to decision making, they’ll feel more entrenched in the team and committed to working toward organizational success. 72% of polled say they have a culture of transparency and honest communication in their company. 6. Give praise where praise is due. It’s no surprise that people appreciate being recognized for a job well done. By complimenting deserving employees, your team members will be motivated to repeat their positive behaviors and overall morale will be improved. 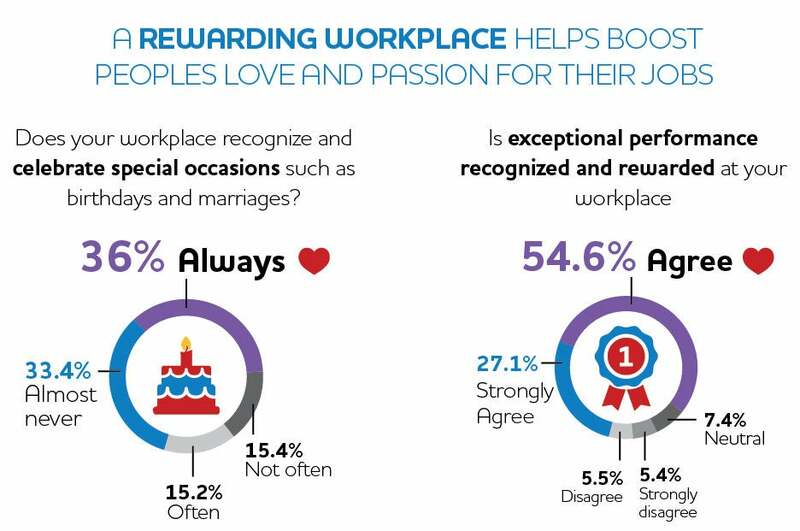 82% of respondents say exceptional performance is recognized and rewarded at their workplace. Build teams within departments, and throughout the entire company, to allow an open discussion of goals and obstacles. There are many exercises that can help teams to find their strengths and weaknesses. These exercises can remove barriers and blind spots and propel the team forward to ever new successes.